What Better Way to Explore Cape Town Than with Boat Cruises? Cape Town is truly spectacular. It’s a world-famous tourism city, offering incredible attractions and sights. There are many ways to experience the different faces of the city, by air, road and boat. Many people choose to take boat cruises when visiting Cape Town, in order to experience the city and its coastal delights from a unique perspective. This is exactly what you can expect when taking boat cruises in Cape Town. We have all the cruise options you could want, offering everything from wedding cruises to team building, lunch and dinner, corporate functions and sunset cruises, as well as everything in between. It all takes place on the Tigger 2 Royale, our celebrated 55-foot luxury power catamaran. This boat is powered by two 530hp inboard turbo charged diesel engines, offering a top speed of 22 knots. Her beautifully streamlined exterior and plush leather interior set the scene for some of the most exciting boat cruises Cape Town has to offer. 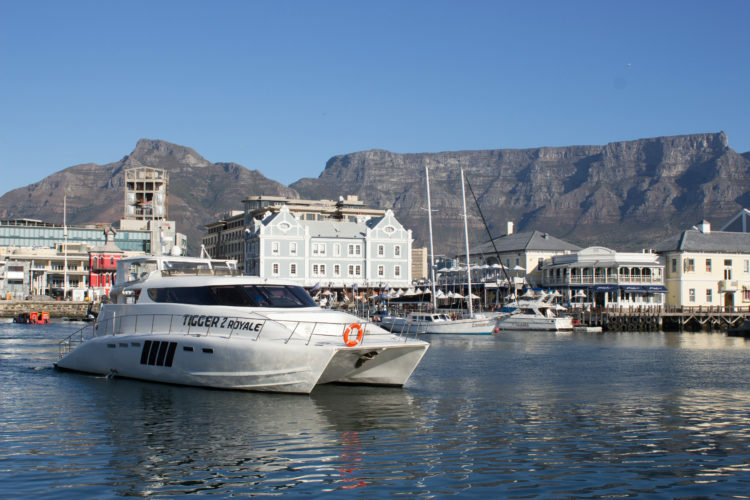 Capable of catering for upwards of 65 guests, the Tigger 2 Royale is perfect for corporate parties, special functions, wedding celebrations or individuals looking to explore Cape Town by boat. By far, one of our most popular boat cruises is our floating restaurant. Our floating venue offers clients the chance to entertain their guests alongside our mooring, situated in the heart of the V&A Waterfront. It’s an ideal option for late-night dinner parties, birthdays, product launches or cocktail parties – with or without a DJ option. It’s a great choice for those who are nervous about heading out to sea, but who still want to experience the feeling of being on a boat. Turn any occasion into a special event. Although every charter with the Tigger 2 Royale is a special occasion, we also offer a very private and exclusive charter for just one couple. This is the perfect solution for those extra special occasions, ranging from wedding proposals and engagements, to wedding anniversaries. These are only a few of the many boat cruise options that we offer in the Mother City. If you would like to learn more about our cruise options and packages, or find out more about our vessel, speak to us today. Book your boat cruise in Cape Town early to avoid disappointment, and look forward to experiencing the city from a unique perspective.